no, I don’t check the 4 hour, I only look at the 1 hour. If you set everything up the way he has it, then look at a 1 hour chart, you’ll see what I’m talking about. all the big crosses (where you could gain a lot) happen in conjunction with all the indicators being where they are supposed to. Sometimes there’s a small or flat cross in a smaller range (10-15 pips) and sometimes the other indicators don’t show anything but that’s because the trend isn’t really changing much. When it does change good, everything is in alignment. So, until I can get an EA built around this, I just have to be patient. I scored 22 on Thursday night with a long on USD/NZD. But I wasn’t awake when it dropped again so I couldn’t profit on the short. Can you please explain how you do this? So you use the RSI, Stoch, and MACD on the H1 with the moving averages, and after a moving average crossover you only take a long if MACD is going from negative to positive or is negative and started to increase in value? Yes, set up the indicators like it says in the cowabunga page. Then when the blue line crosses the purple, look at the rsi and if you’re looking to go long, make sure it’s above 50, check the Stoch and make sure it’s not in overbought territory (above 80) and then make sure that the MACD is either positive or transitioning from neg to pos. What does it mean? exactly? 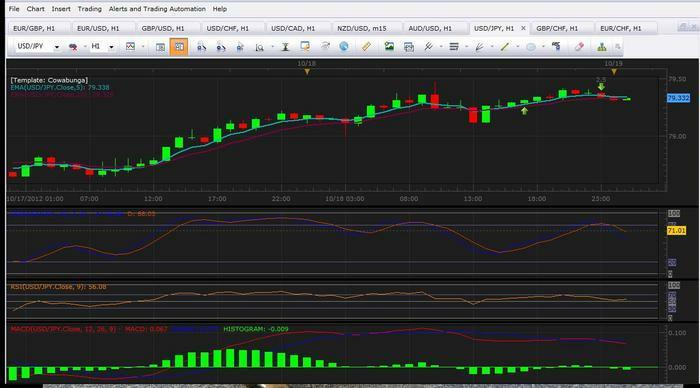 In this pic, I netted 2.5 pips. Not much. I’m still practicing and just wanted to have a win for the day. I could have stayed in it longer to see where things went. At one point I was up 6 but was hoping for more. If you notice, right when I exited, the Stoch began to go down and so did MACD. Anyway, I hope this pic helps you see it more clearly. Also, if you look back a few hours, at 12:00 on the 18th there was another long signal and had I entered I probably would have gotten 20-40. Please can everyone reply to me? no, no backtesting. I’m still new at this. I’ve just been watching things with these settings. I see it in the past quite a bit though (trades i wasn’t around for). I’ve used it successfully on my practice account. I’m finding that I have to keep my emotions out of it (duh!). I’ll see it losing after 10 minutes and get fed up. Then I find that I should have kept it in. Also, I’ve found that the minimum stop loss is 10 pips. I’m usually trying to just gain about 10. I placed 2 trades last night based on this and made my 10 on each. 20 pips while I slept…pretty nice =) Most of the time that I lose it’s because my stop loss wasn’t enough or I had a knee jerk. BTW- when I say I’m new, I’ve only been doing this practice account for a couple months. This is a good and simple system to use, I have been using it on my demo account for almost a month now and have made a returns of about 60% trading only the Eur/Usd because my trading style is to focus on only one pair. I have to admit my lot size is really high and I don’t use stop loss because I want to test it to the limit, TP is usually 20 or 30 pips depending on the strength of the signal I get. I just started using it on my live account this week. 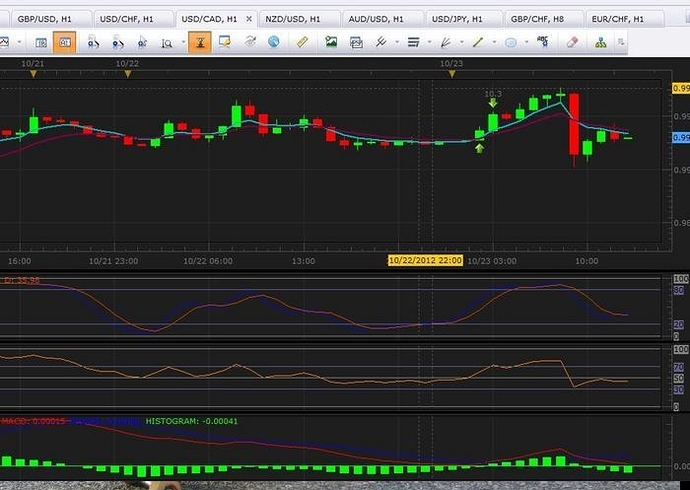 I placed 2 trades last night based on this - EUR/USD and USD/CAD. The EUR I had to wait a few hours after my trade and be patient (at one point it was showing a 9 pip loss) and it finally turned like the indicators said it would. I gained 10 because I set my limit at 10 (going conservative), had I set a trailing stop I probably would’ve been at about 40 or so. I’ve attached a pic of my USD/CAD trade; again you can see that I could have made more than 10 pips but I’m going conservative to get used to things. A clean break is when candle closes below the 50 or 00 level. The question is how many pips it should be below to consider it a clean break. candle closing 5 pips below 50 or 00 level … ? candle closing 10 pips below 50 or 00 level … ? Anybody been successful with this system on their live account? Thanks. Harrilachadd - When you say 2 trades, what window of time are you referring to? Is it 2 trades within the past month or week?